WHAT EVERY WOMAN NEEDS: MY STYLE: IT'S A WHITE OUT! MY STYLE: IT'S A WHITE OUT! I LOVE white. Not ivory or cream or chalk or snow or any other word it might be described as. It has to be white. And for my skin tone, it has to be brilliant white. It makes me feel fresh and alive, clean and vibrant. Suffice to say, my wardrobe contains a lot of white. 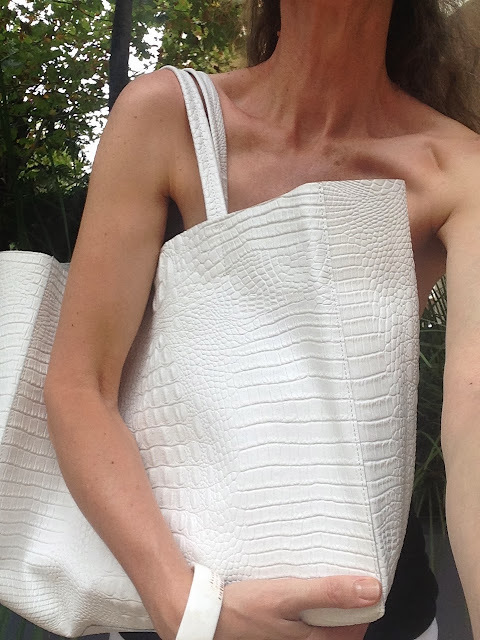 So imagine my excitement when I stumbled across this mock croc leather bag online. Just what this woman needed! The Vintage Princess “Bleecker” tote bag was my Christmas present to myself. I bought it on sale from The Iconic on Christmas Day. (However, I just might have bought the last one in white as it’s no longer available! But other colours include black and beige). And I’m not disappointed. It’s just what I needed to complete my white wardrobe. Being “neutral”, it’ll work with everything! Do you love a white handbag as much as I do? Did you spoil yourself with a Christmas present? Would love to hear of your festive frolics.